A USC football student manager has been relieved of all duties with the Trojan football team for intentionally deflating, below NCAA-regulated levels, some game footballs used by USC's team during the first half in last Saturday's game against Oregon. As a result, the Pac-12 reprimanded USC and imposed a fine. So what was this? Was the student manager really engaging in subterfuge by acting on his own? Was it just a prank? Is the kid just taking the fall for Lane Kiffin because he happened to get caught? Both teams supply their own game balls to use when they're on offense, and to ensure uniformity, the NCAA does have a rule regulating the approximate amount of air the ball ought to hold. Besides, it's not clear what advantage there is to using a slightly deflated football—are they really easier to grip, throw, catch, and kick? I guess it doesn't really matter, since USC lost and Oregon coach Chip Kelly doesn't give two shits about it. 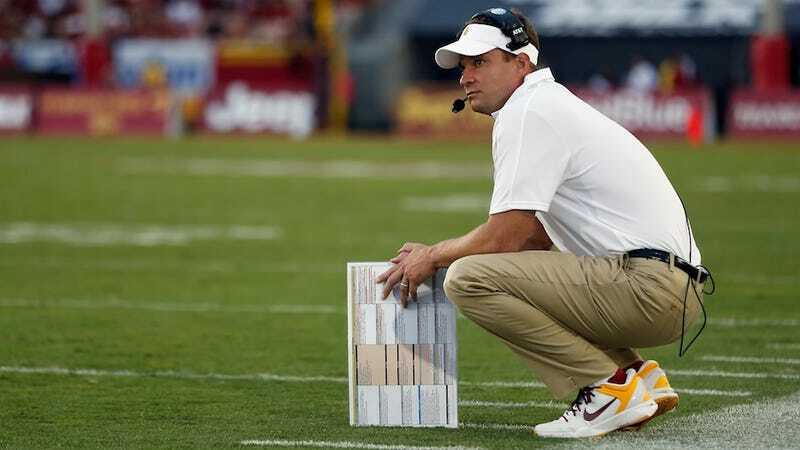 Kiffin told reporters after practice he wouldn't have been brazen enough to instruct the manager to tamper with the balls right there on the Oregon sideline, and that he's not sure what advantage there would be to using two different game balls. And if there's one thing we know about Lane Kiffin, it's his reputation for honesty.